To gain access to the video library, you must register with your DePaul e-mail address at: https://razor.med.und.edu/carma/account/register. The college’s subscription covers everyone with a DePaul email address (they just have to register). Please feel free to share this information with your students & DePaul colleagues in other colleges. If you have been at DePaul for any length of time, you know that we take pride in the fact that "the city is our classroom" and in the many academic programs that take advantage of the opportunities the city provides for teaching, learning, and research. The DePaul University Library has been a long-time partner to academic programs that, in the spirit of our strategic plan, aim "to deepen the university’s distinctive connection to the global city of Chicago." For example, many of you know that we contribute to the "Common Hour" instruction that takes place as part of first-year program’s "Chicago Quarter" courses (and are currently assessing the impact of that contribution as part of a research grant funded by the Association of College & Research Libraries). For classes conducting Chicago-centered research, librarians also provide specialized instruction and research consultations that promote more informed use of popular and scholarly sources documenting the life of the city. We also provide specialized service for those wishing to learn more about the city through our Chicago Collection and our Chicago Research Guide(s). We collect rare books, manuscripts, and other materials as part of our Chicago collections in the Department of Special Collections and Archives and are active partners in the Lincoln Park Community Research Initiative. Finally, and most recently, we have established active partnerships with colleagues at our nearest neighbor in the cultural heritage community as part of DePaul’s partnership with the Chicago History Museum. Beth Rubin shared a great article/video/demonstration with me today. “Article of The Future” demonstrates a new way to format and share academic research. The Article of The Future site showcases a few prototypes (including Business Management) which demonstrate a structure similar to the three-column webpage design. 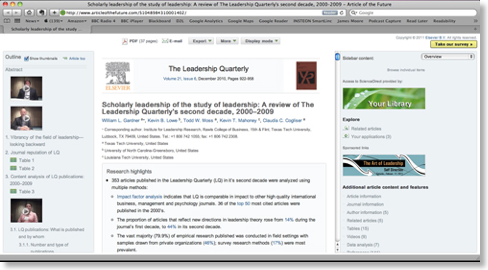 Each pane is independent, and facilitates navigation within the article. I am impressed. 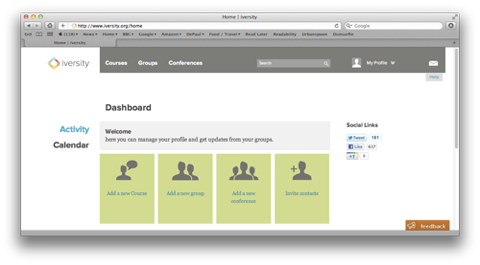 Wondering what authoring software would be used for faculty to create similar documents.